My wife lived in Florence, Italy from 1983 to 1990. She is fluent in Italian and some of her best friends live in Italy. We go back every year to spend time with our friends and enjoy the Italian culture. In 2009, I took three weeks off to write a book. It was the first extended vacation that I had taken in over twenty years. We stayed in an agriturismo just outside of Florence. It was about a twenty minute drive into the center of Florence. An agriturismo is a place where the owner of a large vineyard and/or olive grove has built small apartments in the middle of their land for tourists. It was one of the most beautiful settings that I could imagine. There was only one problem. It was me. I could not really relax. I vaguely sensed relaxing might be a problem before we began the trip. Being in a perfect setting with my mind going a thousand miles an hour was challenging—for all. We had gone into Florence to see my daughter who was attending school over there. We had time to grab a quick lunch. I wanted to eat outside. My wife, who has a much greater appreciation for Italian culture than I, wanted to go to a well-known local trattoria. To me, it looked small, crowded and noisy. After a little discussion, we had lunch at the local trattoria. It was so crowded that we were seated at a small square table with two other people. They were local and were actively engaged speaking in Italian. I wasn’t in the mood to talk to anyone anyway. The food was superb, which helped. As I wasn’t holding up my end of the lunch conversation that well, my wife began to talk to one of the gentlemen on her right. I began to try to practice my very fundamental Italian by listening. The gentleman directly across from me was very engaging and delightful to talk to. He had been eating lunch every day at this spot for forty years. He even received his mail there. He felt that this trattoria was one of the few authentic Florentine cuisines. It was also clear that he was a little down on his luck. I looked behind him and there was a poster on the wall that had his picture on it. It depicted an alien spaceship shining a beam of light down on a bottle of wine. 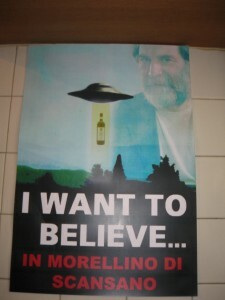 The writing on the poster was, “I Want to Believe.” It had been made for him as a joke by his friends a couple of years earlier. He turned down my offer to buy lunch. Instead he offered to buy us coffee and take us on a tour of my daughter’s school. We still did not know much about him. However, he seemed to know almost everyone and have the keys to a lot of places. He took us to a chapel built around 1100 AD. His description of the room, paintings, and history was astounding. He was brilliant. My daughter eventually joined us and we spent the afternoon with him. I nearly missed a priceless experience. My patients who have undergone multiple failed back surgeries usually had the original surgery performed on a non-structural lesion. Spine surgery is a structural solution for a structural problem. In this context, it works most of the time. Sometimes the structural problems are severe, and surgery can only partially solve the problem. Occasionally, surgery does not go well, and the outcome is compromised. In these circumstances, even surgery for a structural problem may not work that well. However, when a major invasive procedure is done for a vague diagnosis, it does not take a highly trained medical person to figure out that the potential downside can far outweigh the benefit. The person we had inadvertently met for lunch had been a very successful university professor. I don’t know all the details, but I know that alcohol had clearly been a factor in causing his unemployment. When you are desperate to find a solution to your never-ending nightmare of being in chronic pain, you want to deeply believe that surgery is a “definitive” solution to your misery. In your defense the medical profession often holds out that promise. “I want to believe.” The poster on the wall of the trattoria in Florence had the light from the spaceship shining down on the bottle of a wine. I rest my case. Be careful. This section will present many stories of surgical situations that turned out very poorly. Essentially all of them could have been completely avoided. Be very careful in making your final decision about undergoing major spine surgery! !